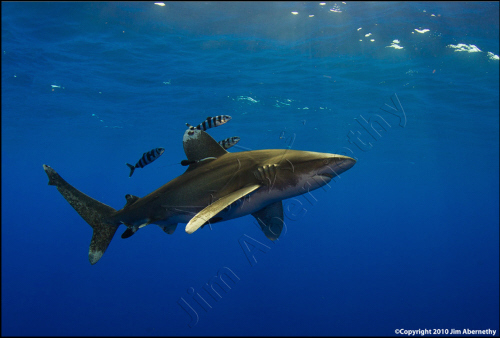 Oceanic whitetip sharks are considered by many to be a poster-child for shark conservation. Once one of the most abundant species of pelagic sharks on Earth, unregulated overfishing throughout their global range had led to a precipitous decline in their population. In some parts of their range, the species has declined in population by more than 70% in the last few decades. Scientists haven’t been able to find them in significant numbers for many years. One of the few remaining known aggregation sites is Cat Island in the Bahamas, and that’s where an international team of researchers just went to find these animals. An oceanic whitetip shark is fitted with a satellite tag. Photo credit: Dr. Lance Jordan, Microwave Telemetry, inc. The team included scientists, SCUBA divers, and volunteers from the Cape Eleuthera Institute’s shark research and conservation program; the satellite tag company Microwave Telemetry, Inc; Stony Brook University; and Stuart Cove’s Dive Bahamas. 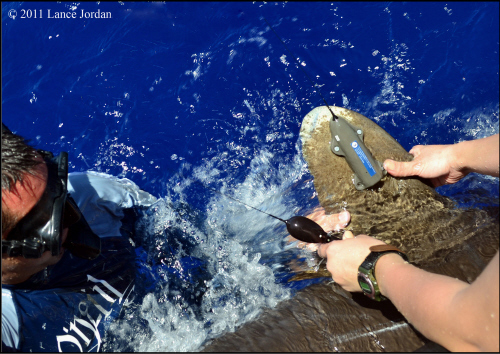 During their ten day expedition, they were able to attach satellite tags to eleven oceanic whitetip sharks. The data from these tags will help scientists to understand where oceanic whitetips, which are considered “highly migratory species”, spend their time. “This species is one of the most endangered pelagic sharks in the world, yet virtually nothing is known about its basic biology and ecology, something this project will hopefully change,” said Edd Brooks, program manager, shark research and conservation program at Cape Eleuthera Institute. Data collected by the Microwave Telemetry tags includes light levels, depth, and temperature, and approximate position. Five of the seventeen tags are state-of-the -art and also provide real-time geographic position for up to a year and a half. “Hopefully, the data we collect will aid fisheries managers in their decision making and give this species a real shot of rebuilding,”, said Lucy Howey-Jordan of Microwave Telemetry, Inc.
It’s no coincidence that the Bahamas are one of the few places left on Earth where oceanic whitetips are found in (relatively) large numbers. They are one of the few nations to have banned longline fishing, and Bahamian waters boast some of the highest shark diversity in the Atlantic ocean. Conservation organizations like Pew point out that shark ecotourism is worth up to $78 million to the Bahamas each year. While it’ll take more than real-time habitat use data to protect this species, the state-of-the-art technology and international cooperation that are the foundation of this project is a big step in the direction of recovery for oceanic whitetip sharks.